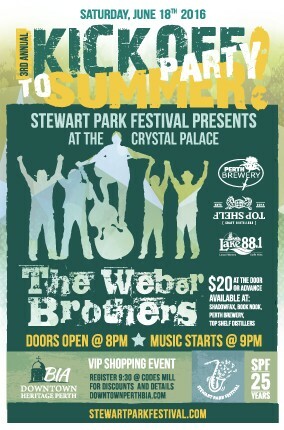 Mark your calendars for June 18th, 2016 for the Stewart Park Festival Kick-off to Summer Party with Special Guests The Weber Brothers! Join us at our 3rd Annual Kick-Off to Summer party. June 18 @ the Crystal Palace. Trust us there will be dancin’. With their eclectic mix of rockin’ originals and cool cover tunes, The Weber Brothers are the ultimate dance band. Think the harmony of The Beatles and the backbeat of the Band. Got it? Now experience it live! June 18th. Tickets only $20.00. On sale soon at Shadowfax, Book Nook, Perth Brewery and Top Shelf Distillery. Doors at 8:00 pm. Music at 9:00 pm. Door prizes. Pizza. A licensed event. Available at the door or at Shadowfax, Book Nook, Perth Brewery, Top Shelf Distillery. Bring a lawn chair and enjoy a performance by the Perth Citizens’ Band at 7:30 p.m. at the bandstand behind the Town Hall. 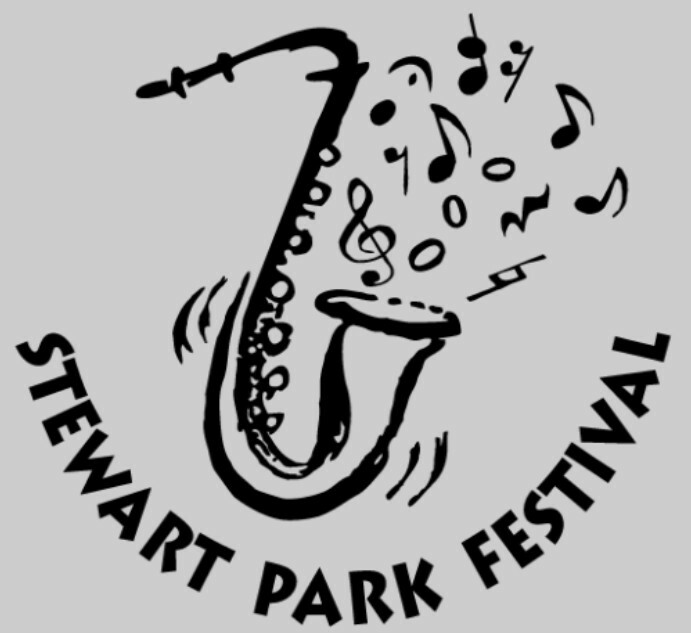 All concerts are FREE to the public and are held in historic Stewart Park just behind the Perth Town Hall in downtown Perth. The Perth Citizens’ Band has been an integral part of the musical and cultural heritage of the Town of Perth since 1852 and is the oldest continuously operating band in Canada. The continuity of the band from 1852 has been recorded in a book entitled, “ Sound the Trumpet “ written by local archivist, Daphne Overhill, published in 2002. 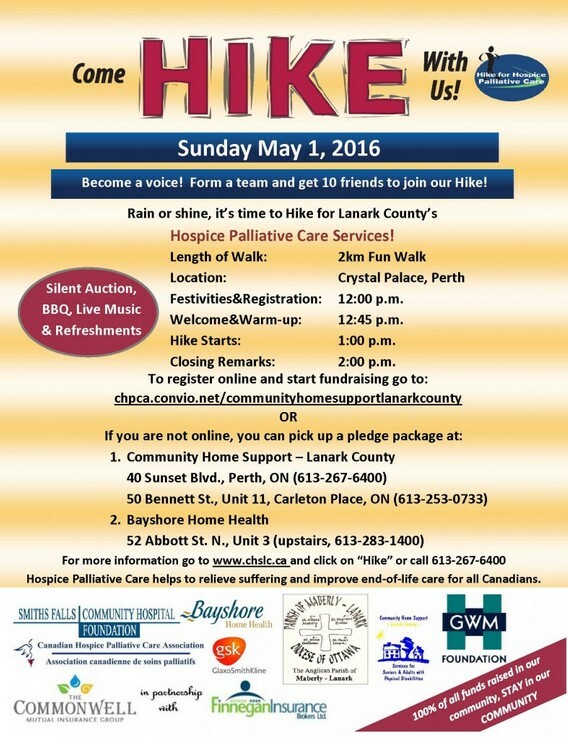 The band is comprised of members from Perth and surrounding areas of Lanark County. Every Tuesday night at 7:30 the band meets for rehearsal in a specially designated room upstairs in the Perth Town Hall. A wide variety of music is rehearsed from the bands’ extensive library, ranging from classics by Mozart, Handel etc. through the Gay Nineties, The Swing Era, the Beetles, Broadway, and contemporary works. Band membership is about 50 and includes all ages from teens to seniors with skill levels from beginners to professional. 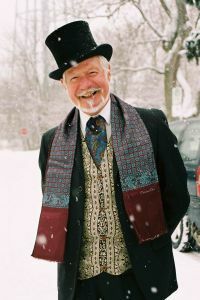 Some members also contribute time to other local groups such as the “Saints and Sinners” , The Perth Community Choir, and The Last Duel Brass Quintet. The band is directed by Brian Tackaberry, a professional high school music teacher. Music is performed in public throughout the Town and surrounding areas including venues such as churches, schools, special events, parades and an annual summer concert series on the bandstand in Stewart Park behind the Town Hall. Historically, the band has played at Ontario’s Bicentennial celebrations in Toronto, the sending of the Perth’s Mammoth Cheese to The Chicago World’s Fair and more recently, at The Governor Generals Garden Party at Rideau hall and the Town band Festival in Orono, Ontario. 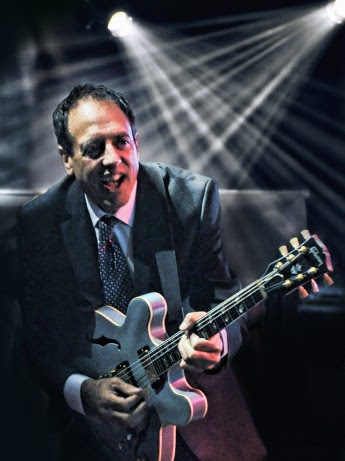 The free concerts in Stewart Park are performed every other Thursday at 7:30 PM starting in the second week of June through the third week of August and include a Strawberry Social starting at 7 PM for the second concert. The band does a number of parades throughout the year including the Perth Fair Parade, parades for various local celebrations in other towns and typically four Santa Claus Parades in various towns. A major part of the bands funding for operating expenses comes from these parades. 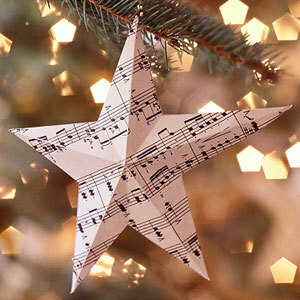 The band also does an annual Christmas concert, an annual “ Last Night At The Proms Concert ” plus a number of other concerts during each year. The band works during rehearsal times and socializes during breaks. Many lasting relationships are formed. Band membership includes married couples and children all volunteering their time for their own benefit and for the benefit of their audiences. Bring your dad, spouse or any special man in your life out to Stonefields for a delicious BBQ to celebrate Father’s Day on June 12th, catered by The Mixing Bowl and in support of the Lanark County Food Bank. Doors open at 4:30pm with dinner beginning at 5pm, and entertainment until 9pm. To RSVP and purchase your tickets email us at fathersday@stonefieldsheritagefarm.ca or call 613-253-3313. Please join us in our efforts to support the Lanark County Food Bank by bringing a non-perishable item or cash donation to help local families in need. Call 1-800-518-2729 to charge to a credit card or order on line now! Saturday, November 15, 2014 doors open at the Civitan Hall (6787 Hwy. #43) at 7pm, for KOBO TOWN, a Toronto-based calypso-type band, with a diverse mix of Caribbean and other influences. Band performs at 8pm. Tickets are $20 in advance at Coutts & Company, or $22 at the door. Proceeds to the GUATEMALA STOVE PROJECT.